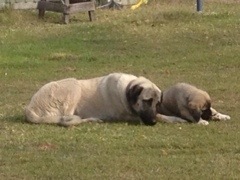 Lucy is the the Dam of Tribocie’s C litter. 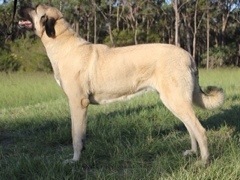 She is an active property and livestock protection dog residing on her 100acre property in the NSW Hunter Valley. Lucy whelped an outstanding litter in 2013 producing both exceptional guardians and exemplar show dogs. These include “Tribocie Takes the Jaffa Cake” (NSW), “Tribocie Hard Nut to Crack” (TAS) and Best Baby Puppy In Spcecialty Show and Multi Class in Show winning Milo “Aust. Ch.Tribocie Stir It Up” and Domino the Dynamo “Tribocie Sweet As Pie” who won Best Baby Puppy in Group at her first show. Lucy is also the dam of Esra “Tribocie Spice Things Up” who was awarded RUNNER UP TO BEST IN GROUP from the Puppy Class at 11 months of age and Rasta “Aust. Ch. Tribocie Cooking Up a Storm” is the ONLY Anatolian to win an All Breeds BEST IN SHOW at just 14 months. Lucy will hopefully whelp a very exciting litter at Tribocie in 2015.